Elegant beauty and sophisticated style are just a few stitches away! Beautiful baroque designs featuring your favorite flora and fauna are chic additions to pillows, wall hangings, quilts, and more. 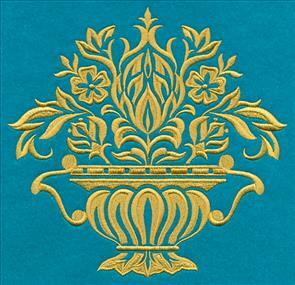 Add a flowering baroque spray to jackets and pillows, or an animal cameo on a tote. 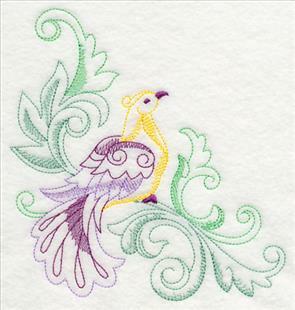 Light flourishing birds make the perfect set of bed linens, while fantasy goldwork adds a majestic look to quilts, kids' gear, and more! 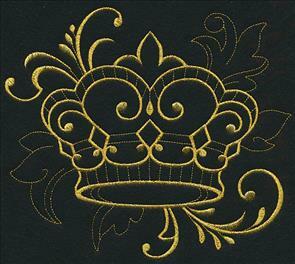 Stitch a project worthy of royalty with birds in crowns or blooming baroque designs. Plus, a little lace makes a fabulous lampshade in our new project! 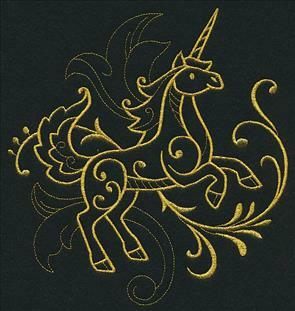 Scroll down the page to see these majestic designs. 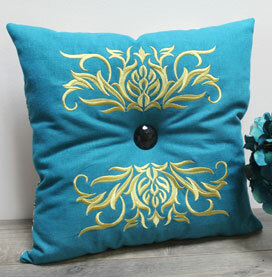 Add a hint of elegance to your home decor with this beautiful tufted pillow! Find the design used here. Striking floral bouquets combine the beauty of nature's flora with majestic baroque flourishes. 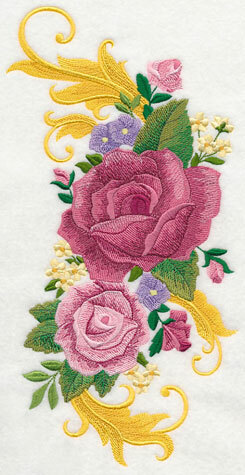 Let these gorgeous mums and roses blossom on apparel, wall hangings, purses, and more. 5.83" x 11.73" and 4.67" x 9.37"
5.78" x 11.72" and 4.64" x 9.38"
3.84" x 7.80" and 3.39" x 6.87"
This delicate peony design adds a soft, femininity to denim jackets, cushions, and pillows. 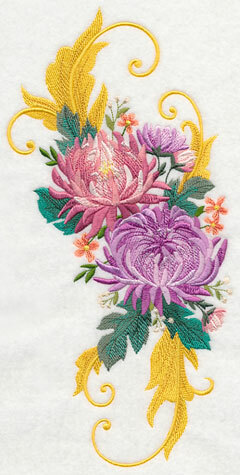 The light pinks and purples of the blooming flowers contrast beautifully with the gold accents. 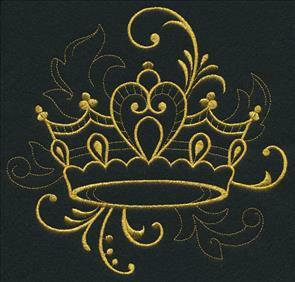 5.89" x 11.75" and 4.71" x 9.40"
3.91" x 7.80" and 3.44" x 6.86"
Stitch a design fit for royalty with these his-and-hers crown motifs! 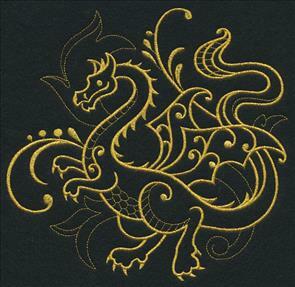 Exquisite filigree adds even more elegance; metallic thread is a regal touch. 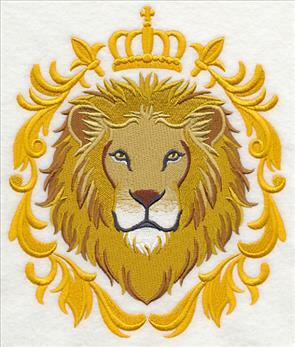 Get more information about stitching with metallic thread. 7.81" x 6.81" and 7.28" x 6.35"
6.73" x 5.87" and 5.58" x 4.87"
An impressive castle and ferocious dragon continue the fantasy theme in these designs. 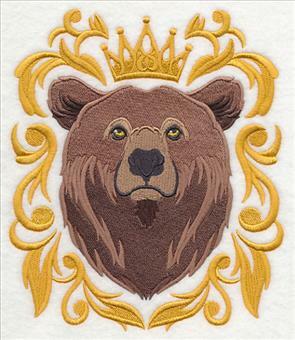 Stitch all six on a quilt, wall hanging, or set of framed pieces for a fun fairy tale scene. 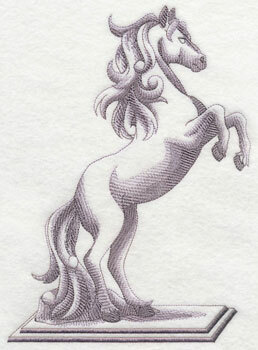 7.58" x 7.80" and 6.85" x 7.04"
7.81" x 7.48" and 7.15" x 6.85"
6.11" x 5.86" and 5.07" x 4.86"
A griffin and unicorn are mystical additions to any embroidery project. 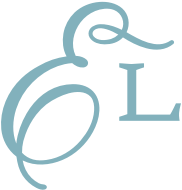 Stitch on kids' gear, book bags, apparel, and more! 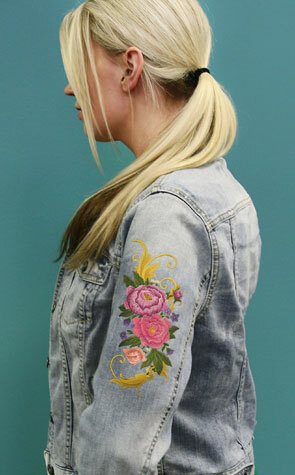 You'll find our best tips and tricks for stitching with metallic thread right here. 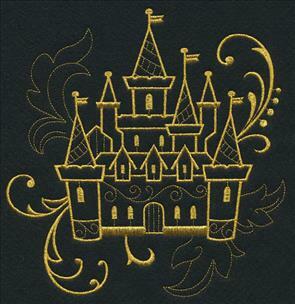 7.31" x 7.81" and 6.85" x 7.32"
7.38" x 7.80" and 6.85" x 7.24"
Purchase these fairy tale designs individually by clicking the links above, or get all 6 of the fantasy flourish designs. 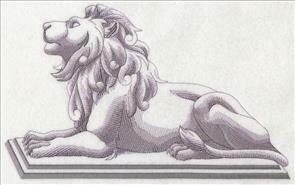 Lions, and tigers, and bears -- oh my! Nature's fiercest animals get a magnificent makeover when stitched in intricate baroque cameos. Awesome on totes and pillows! 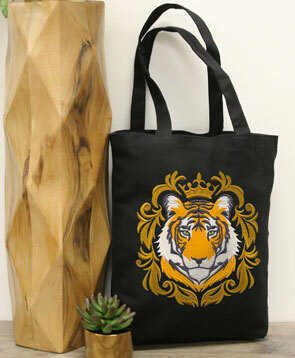 6.86" x 7.57" and 5.86" x 6.42" and 4.80" x 5.26"
The jet black color of this tote bag makes it the perfect place to stitch this imperial tiger. A gold baroque cameo frames his face while adding a regal look. 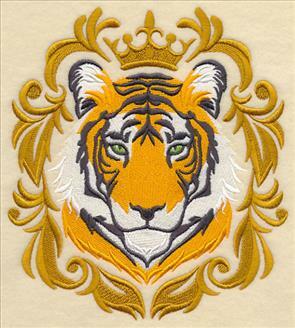 Each of these marvelous animal cameo designs are terrific on pillows, wall hangings, and jackets, too. 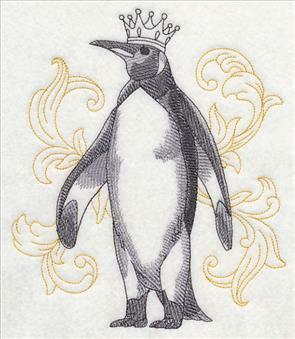 Pick your favorite of the dignified designs, or stitch them all! 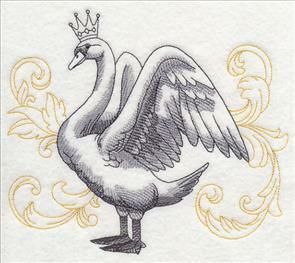 6.62" x 7.80" and 5.86" x 6.90" and 4.86" x 5.72"
Light, muted baroque filigree adds elegance to the background of these designs; sketch-style birds in crowns create a focal point in the foreground. 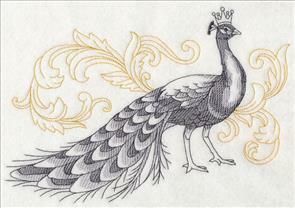 Each of the four birds -- peacock, swan, flamingo, and penguin -- strut their stuff in these designs. 9.82" x 6.90" and 8.33" x 5.85"
7.80" x 6.74" and 6.77" x 5.85" and 5.61" x 4.85"
These motifs feature light stitches and open areas, making them fabulous additions to neutral, smooth, low-nap fabrics. Stitch on tea towels, tote bags, denim, and more. 6.75" x 11.00" and 5.52" x 9.00"
6.73" x 7.80" and 5.84" x 6.77" and 4.83" x 5.60"
Floral baskets overflow with breathtaking damask flowers and greenery in these designs! 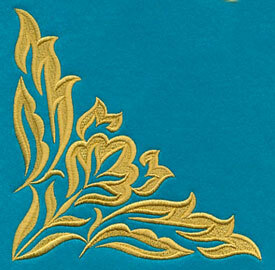 The luxurious blooms feature a gold color and exquisite detailing to give off an elegant appeal. 7.81" x 7.52" and 7.03" x 6.77"
7.81" x 7.60" and 7.09" x 6.90"
6.03" x 5.86" and 5.00" x 4.86"
These blooming baroque designs are striking additions to placemats, table runners, tablecloths, bed linens, towels, and more. 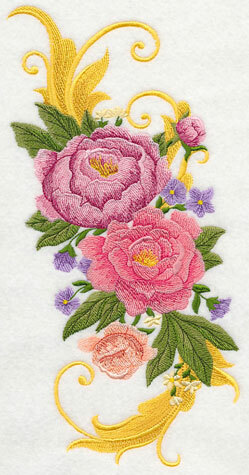 They're fabulous for adorning embroidery projects with flourishing beauty. 10.21" x 4.26" and 9.41" x 3.95" and 7.81" x 3.28" and 6.00" x 2.67"
A vertical spray in this style pops against bold, bright colors. Here we've paired it with a colorful teal blue -- try against black, purple, or other brilliant hues! 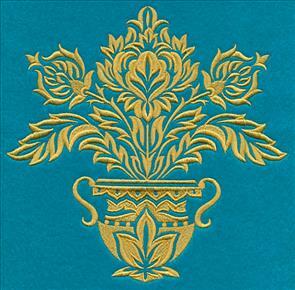 3.00" x 10.21" and 2.78" x 9.41" and 2.31" x 7.81" and 2.03" x 6.86"
These matching corner and accessory designs are striking when stitched on pillows, quilts, napkins, and more. Pair it with the above designs, or stitch alone. 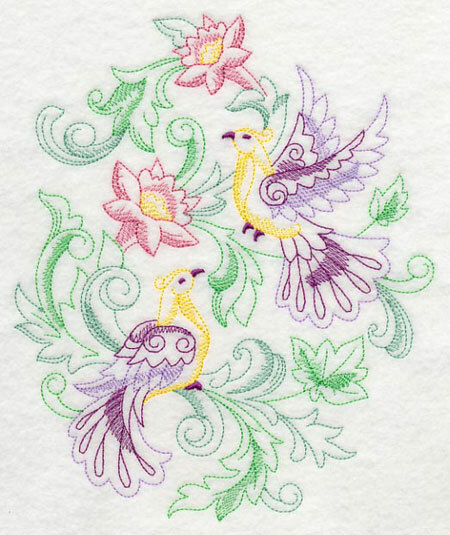 Colorful and charming baroque birds add a sweet look to tea towels, linens, and more! 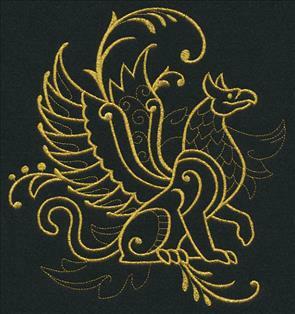 Flourishing branches and flowers give these filigree feathers a place to perch. 6.85" x 8.23" and 6.35" x 7.63" and 5.85" x 7.03" and 4.85" x 5.83"
These designs use shading and a variety of colors for wonderful depth and texture. 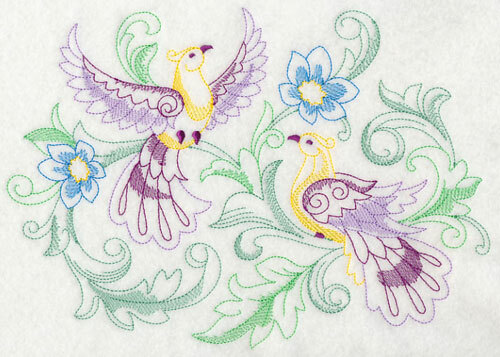 Stitch the sweet tweets on a set of bed linens, or use on a wall hanging or quilt. 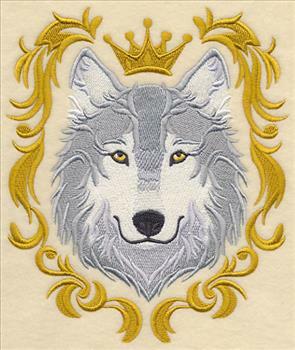 9.68" x 6.85" and 8.26" x 5.85" and 7.56" x 5.35" and 6.84" x 4.85"
Because these designs feature lighter stitches, shading, and open areas, they're best stitched on smooth, neutral surfaces. Try fabrics such as canvas, linen, denim, and twill for best results. 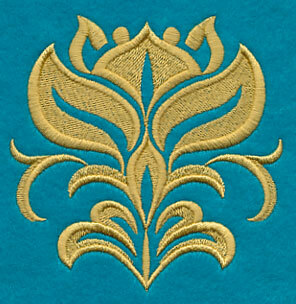 11.75" x 3.92" and 9.40" x 3.13" and 7.80" x 2.60" and 6.00" x 2.28"
The fluttering filigree corner and accessory are fabulous complements to the designs above, or can be stitched on their own to highlight a pocket, napkin, or scarf. 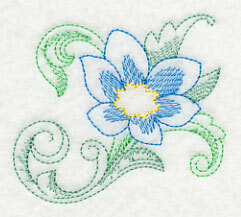 Let one of these flourishing designs land on your next embroidery project today! You can purchase the designs individually by clicking the links above, or get all the designs in a pack! A horse and lion depicted as magnificent marble sculptures are gorgeous additions to pillows, aprons, framed wall pieces, and more! 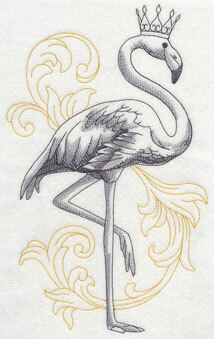 This sketch-style is a particularly beautiful way to display the artistic designs. 11.16" x 6.88" and 9.38" x 5.78"
7.79" x 4.80" and 6.86" x 4.23"
Create a soft, elegant glow in your home with a lace wine glass lampshade! 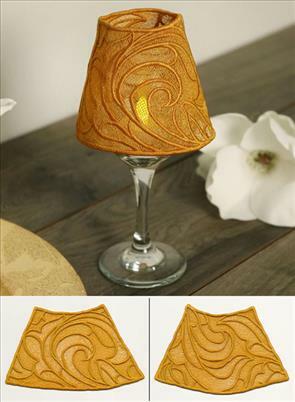 A battery-operated candle perches inside the wine glass and shines through the lace for an elegant and eye-catching look. Find the free project instructions for this lampshade right here. 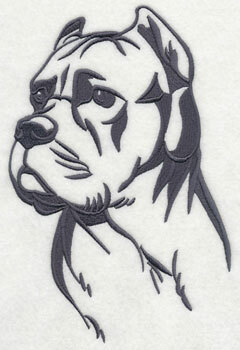 Mary Jane works with a lot of animal designs, and was particularly searching for ones featuring the Cane Corso dog breed. 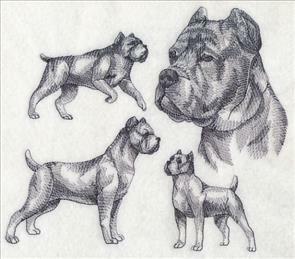 Here the dog is depicted in four poses, and is shown in two variations -- one with and one without cropped ears and a docked tail. 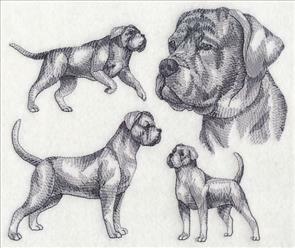 7.79" x 6.90" and 6.57" x 5.82" and 5.48" x 4.85"
In addition to the sketch designs above, the Cane Corso dog breed has also been created in the silhouette style. 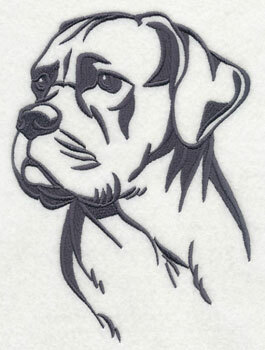 Stitch on a project for your favorite pup! 5.86" x 8.77" and 4.58" x 6.86" and 2.58" x 3.86"